Zinnias can be a bright-colored addition to any garden, particularly when planted in mass. What are zinnias? Zinnias are one of America’s most popular annual bedding plants, but have humble origins as descendants of nondescript wildflowers native to the southwest U.S., Mexico and Central America. The zinnia was named after the 18th century German botanist Dr. Johann Gottfried Zinn, who wrote the first description of small, weedy plants that he discovered in the Mexican deserts. These plants had dull purplish-red, daisy-like flowers with single petals surroundng a protruding cone. Early varieties of garden zinnias were introduced in the U.S. in 1796, with double forms appearing in the mid-1800’s. Interest in zinnias increased in 1920 when Bodger Seeds Ltd. introduced the dahlia-flowered varieties ‘Giant Dahlia’ and ‘California Giant’. These varieities had large, flat-flowered heads and multiple colors. ‘California Giant’ eventually won a gold medal from the Royal Horticulture Society of England. Today, zinnias come in a wide variety of flower forms: single, semidouble, or double. Single-flowered zinnias have one row of petals and the center of the flower is exposed. Semidouble-flowered zinnias have many rows of petals and the center can still be seen. Dahlia-type zinnias (typically semidouble) have large, flat blossoms. Double-flowered zinnias have so many rows of petals that flower centers are hidden. There are several types. Beehive-types have small blooms with stacks of flat petals resembling small beehives. Button-types are similar but have flatter flowers. Cactus-types have twisted, bent petals with rolled edges. Although there are more than a dozen species of zinnias, only a few species are regularly planted in gardens. Zinnia elegans is the most common. It grows up to three feet tall and has single or double flowers in pink, rose, red, cherry, lavender, purple, orange, salmon, gold, yellow, white, cream or light green. Flowers range in size from one to seven inches in diameter and can be solid-colored, multicolored or zoned. Flower shapes include round, domed or ball-shaped, as well as dahlia-like or chrysanthemum-like. Tetraploid varieties (having four sets of chromosomes, rather than the normal two) were developed in the 1950’s, and these varieties produce larger flowers on stronger stems, grow more vigorously and have increased disease resistance. Hybrid varieties were developed soon thereafter. There are many varieties of Z. elegans available at garden stores, including the following. • The Border Beauty series has plants that grow up to 20 inches tall and have 3½-inch-wide semidouble to double, dahlia-like flowers. • The Peter Pan series has dwarf hybrids that grow up to 12 inches tall and have very large (up to five-inch-wide), slightly curled, double flowers. Seven separate colors in this series have been recognized as All-American Selections (AAS) winners. • The Ruffles series was developed for cut flower production. Plants grow up to 30 inches tall and have 2½-inch-wide, ball-shaped flowers with ruffled petals on stiff, upright stems. ‘Scarlet Ruffles’ was named an AAS winner in 1974, ‘Cherry Ruffles’ and ‘Yellow Ruffles’ AAS winners in 1978. Z. angustifolia (synonym Z. linearis) has small, single, golden-orange flowers with yellow stripes, and narrower foliage than Z. elegans. These compact plants grow eight to 12 inches high, and can spread to two feet. The variety ‘Crystal White’ has pure white flowers with yellow centers and was an AAS winner in 1997. A cross of Z. elegans and Z. angustifolia yielded the Profusion series of zinnias which has compact plants with two to three-inch-wide, single flowers. Members of this series have superior heat and humidity tolerance, and tend to be disease resistant. Two members of this series ‘Cherry Profusion’ and ‘Orange Profusion’ won gold medals from AAS in 1999 (the first awarded to flowers in 10 years). Z. haageana (Mexican zinnia) grows up to 18 inches tall and has small 1½ to two-inch-wide flowers on long stems. Flowers may be single or double, solid or bicolor, in red, mahogany, yellow and orange. Two popular varieties may be available at your local garden center. • ‘Old Mexico’ (an AAS winner in 1962) has bushy, compact, 18-inch-tall plants with double, 2½-inch-wide blooms of deep, rich mahogany highlighted with yellow-gold. Z. pauciflora (synonym Z. peruviana) grows up to 30 inches tall and produces 1½-inch-wide, single, red or yellow flowers with button-like centers. This zinna is good for cutting and drying, and has powdery mildew resistance. Only varieties ‘Bonita Red’ and ‘Bonita Yellow’ are readily available. Where do I get zinnias? 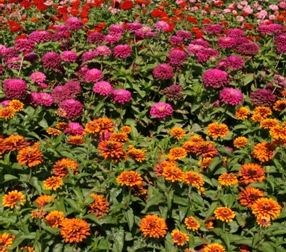 Zinnias can be purchased as bedding plants, but local garden centers often have only a limited selection of varieties. As an alternative, zinnias can be started from seed, either indoors four to six weeks before the last expected spring frost, or directly in the garden when the soil warms sufficiently. Germination takes five to seven days. Many references warn that zinnias do not like being disturbed and should not be moved after seeding. However, plants can be seeded individually in cells of seed-starting trays or even transplanted into these cells from mass plantings. When transplanting into trays, wait until the first true leaves have emerged. Separate roots as carefully as possible and place seedlings into their new cells up to the first set of leaves (the seedling leaves). Select appropriately sized tray cells based on the predicted size of the varieties being grown. Otherwise, tall varieties may outgrow their cells before it is time to plant them outdoors. Once the danger of frost has passed, zinnias can be transplanted outside. However, do not expect substantial growth until temperatures are above 50°F. How do I grow zinnias? Zinnias do best in full sun in fertile, well-drained soil. Space plants four to 24 inches apart depending on variety. When growing zinnias for cut flowers, crowd plants to encourage longer stems. To produce bushier plants, pinch the tops out of plants when they are four to six inches high. Remove faded blossoms to encourage new blooms. Plants should be kept well-watered and fertilized two times per month for optimum bloom. Most varieties begin to bloom when very young and continue to bloom until frost. 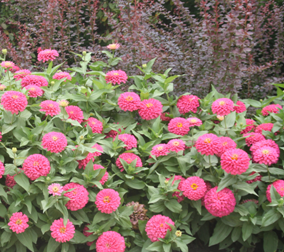 Zinnias have few insect pests, but occasionally can have problems with aphids (see University of Wisconsin Garden Facts XHT1043), four-lined plant bugs (see University of Wisconsin Garden Facts XHT1101) and spider mites. Common diseases of zinnias include powdery mildew (see University of Wisconsin Garden Facts XHT1005), Alternaria leaf spot and bacterial leaf spot. How do I use zinnias most effectively in my garden? 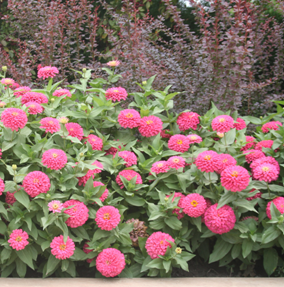 Zinnias make good edging plants, but are also effective when grown in masses. Taller varieties make good background plants in flowerbeds, while smaller varieties are suitable for container plantings. 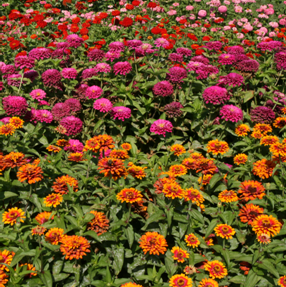 Zinnias are great additions to butterfly gardens and many varieties make excellent cut flowers. For more information on zinnias: Contact your county Extension agent. Zinnias can be effectively used in gardens as an edging plant.